Although flowers predominate in most early books of medicine printed in Europe, ferns have long been used alongside them. While many books about the development of botany and medicine do mention ferns, they have received little attention as a distinct category. 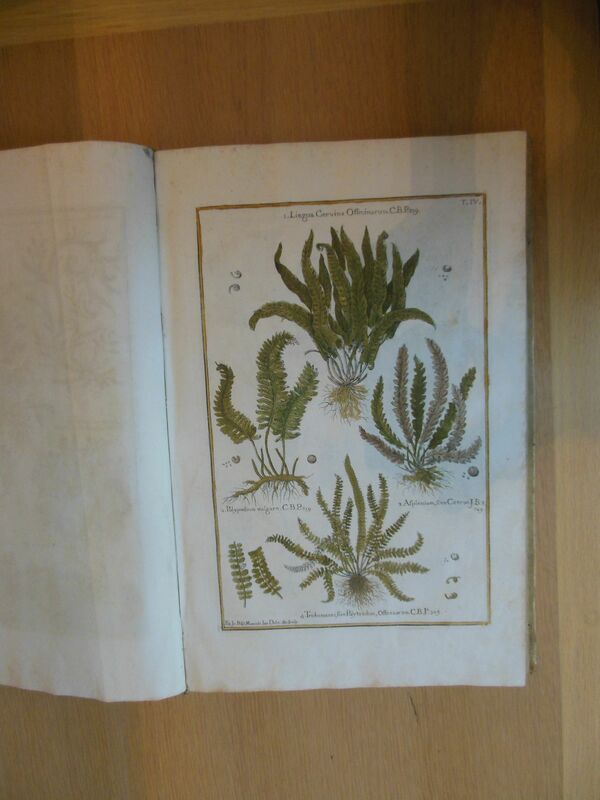 This post highlights a selection of ferns that appear in medicinal plant books published in the fifteenth, sixteenth, and eighteenth centuries. Jacob Meydenbach, Ortus sanitatis, chapter CC. This fern, which the text describes as a plant that “has neither a trunk, nor a flower, nor fruit” and “has a smell that is not good,” comes from the oldest book in Dumbarton Oaks’ Rare Book Collection. The Ortus sanitatis, or “Garden of Health,” was an herbal published in 1491 as a reference work for doctors and apothecaries. Among the uses the text claims for this fern is that, when dried and ground and made into a poultice, it would cure congestion. The numerous “manicules”, or little hands pointing to important passages in the section on each plant’s use, show that this was a working copy. In this herbal, the images of plants are stylized and conventionalized. The fern above is leafy and generic, with no root and no venation—the image does look like a fern, but we need the label contained in the text to confirm our identification. Although the fern woodcut does not repeat, some of the other entries in the Ortus sanitatis even share the same image for different plant species. Paying someone to create new illustrations was expensive, so plants that looked similar enough could share the same image. Antoine Du Pinet, Historia plantarum, 630-631. 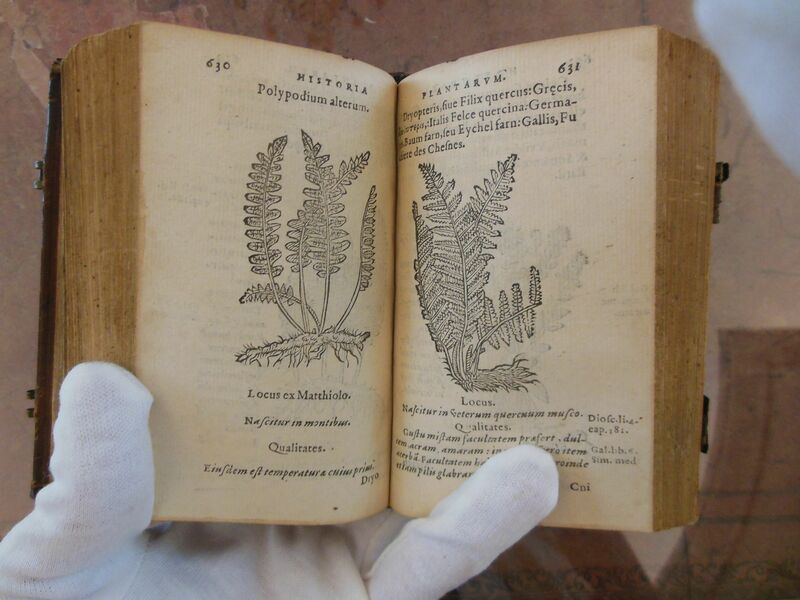 Antoine Du Pinet’s pocket herbal (1567), published nearly 80 years later than Meydenbach’s book, and heavily indebted to Pietro Andrea Mattioli’s Commentary on Dioscorides, shows ferns that display increased botanical specificity. Both ferns in the image have root systems, unlike that in the Ortus, and the leaves are more distinctly rendered. The fern on the recto has numerous small blades, while the fern on the verso has larger and more rounded blades, with the sporangia visible. (‘Sporangia’ are the structures that enclose ferns’ spores.) While the leaves are rendered in broad strokes, this herbal accounts for more than one species of fern. Giovanni Battista Morandi, Historia botanica practica, plate 4. The illustrations’ specificity increases again in a third book about plants’ medical uses, Morandi’s Historia botanica practica (1744). While Meydenbach’s herbal made it possible to tell that the image was of a fern and Du Pinet’s book made a few distinctions between the ferns included, Morandi’s four ferns multiply the differences between the species pictured. More attention is now given to leaf shapes, root forms, venation, and sporangia than in the two earlier works, making it increasingly easy to use the images to identify a fern specimen. Du Pinet, Antoine. 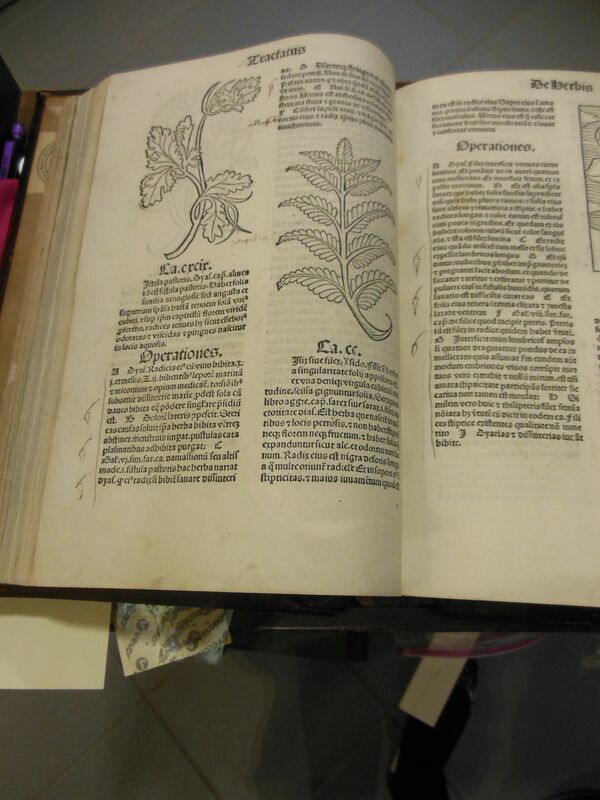 Historia plantarum. Lyon: the widow of Gabriel Coterius, 1567. Meydenbach, Jacob. Ortus sanitatis. Mainz: 1491. Morandi, Giovanni Battista. Historia botanica practica. Milan: Petrus Franciscus Malatesta, 1744.